Learn proper technique for the freehand trick Dice Grinds. This is the basic version. 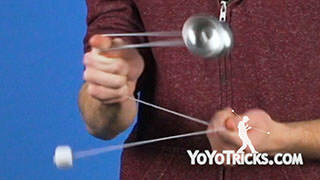 And then you can hop the yoyo between your hands as a more advanced variation. 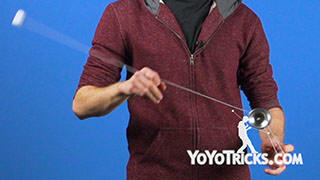 Now in order to do this trick, you need to know how to throw, mount, and bind a yoyo horizontally. So if you are not sure how to do that, you should definitely check out our horizontal basics tutorial video. 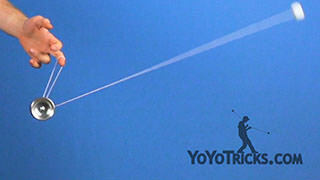 Also, Dice Grind is a little bit more equipment dependent that other yoyo tricks. So just make sure that you have a plastic counterweight like the Ultraweight or like a Duncan Dice instead of something like a rubber ball counterweight. 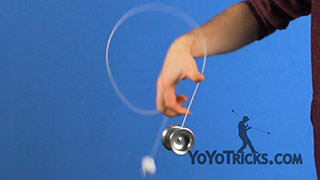 When it comes to the yoyo, pretty much any modern yoyo with a cup will work. 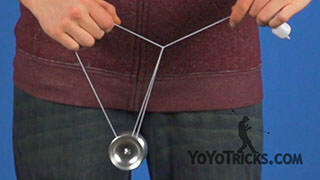 So to start the trick, you want to throw the yoyo horizontally. Then do a banana turnover and just let the yoyo pinwheel underneath our non throwhand. 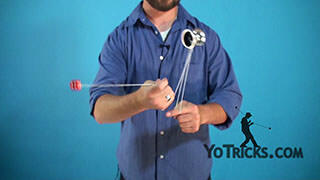 Then we can look at setting up the counterweight in our throwhand so that the yoyo can land on it properly. To do that, what you want to do is put the string between your throwhand ring finger and middle finger so that the counterweight comes through your fingers just like this. Also, you want to take your throwhand and flex it down as much as you can because when the yoyo is spinning on top of the counterweight you do not want your hand curled up, which is going to slow down the yoyo. 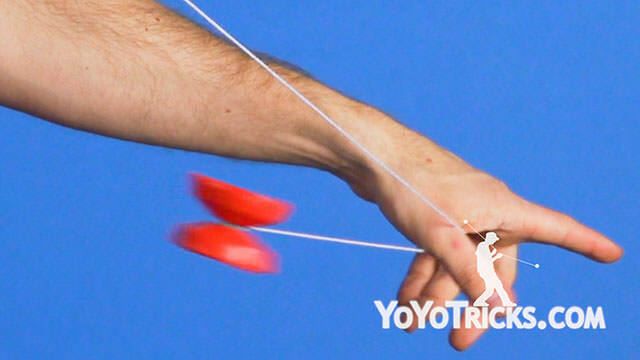 After you get the counterweight position correctly in your throwhand, then while you are pinwheeling you can simply take the yoyo, lift it up, move your throwhand underneath the yoyo, and then slightly drop your hand to cushion the fall of the yoyo, just like that. You will notice while the yoyo is grinding on the dice, I am actually holding the string with my non throwhand. 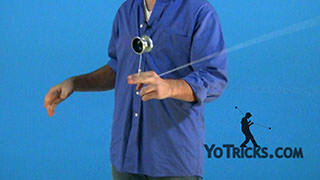 What that does is help control the spin of the yoyo just a little bit. So if I pull too hard, the yoyo is going to start tilting. If I do not pull at all, the string can actually wrap around the yoyo, which is definitely something that you want to avoid. 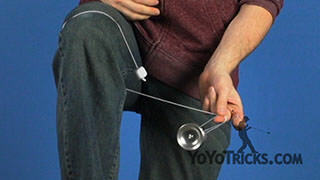 Now, once the yoyo is spinning on the counterweight, you can let it spin there for as long as you are able to make it to. 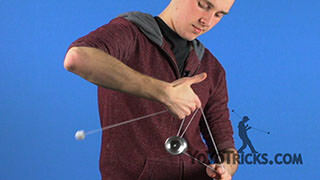 To dismount from the trick, all that you have to do is hop the yoyo up and then you can bring the yoyo into an undermount and bind. So that is the simple version of dice grind and it is something that I recommend that you really practice and master before you move on to the advanced hand switching. Now, for the Advanced Hand Switching version of Dice Grind, we actually need to set the counterweight up in our hand a little bit differently. So rather than having the string go between our ring finger and our middle finger on our throwhand, instead we want to pinch the counterweight between our thumb and the line of knuckles right here on your palm. You do not want the counterweight to be directly in your palm because that is actually the lowest part of your hand, which is going to make the yoyo’s rim touch your palm, and that is just no good. So, you want to pinch the counterweight right up here. 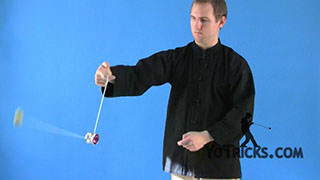 Then as the yoyo is coming down, you want to move your thumb away just like this. 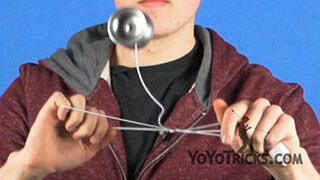 The yoyo can fall onto the counterweight, and it is going to start spinning. 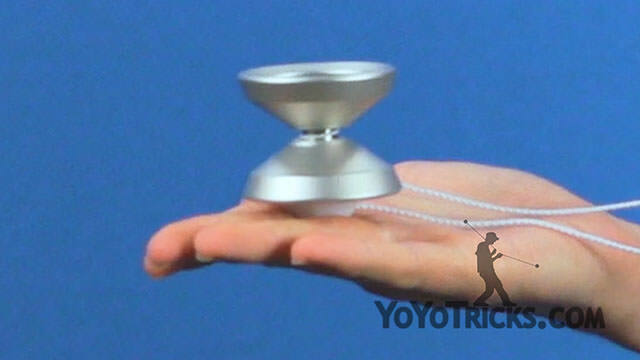 Now, immediately what you are going to notice when you first try this, is that the yoyo starts moving around on your hand a lot. Just like that. That is pretty much always because your hand is not perfectly flat. 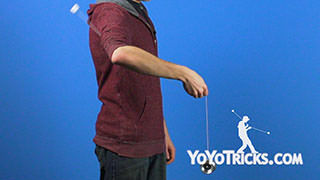 If your hand is tilted even a little bit, the counterweight is going to roll down your hand in that direction and it is going to take the yoyo with it. That is just no good. 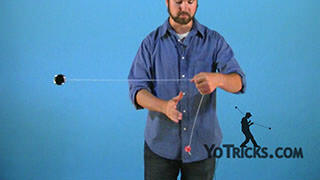 So as you are practicing the advanced thumb grip technique, what you want to do is, do a dice grind and then just focus on keeping the yoyo as still as possible in your hand. That is going to take a little bit of practice before you get it down right. After you have mastered that, you can move on to the hand switching. This is something that is really cool because it does not only have to be in front of you. It can also be under your leg or even behind your back. Now, dice grind hand switching uses that same advanced thumb to palm counterweight holding technique that we just went over. 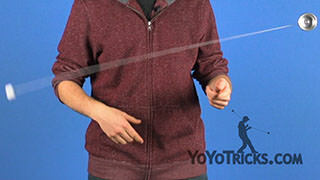 So you definitely want to master keeping the yoyo as still as you can with that advanced holding technique before you move on to hand switching. Otherwise you might find that you get frustrated. These two tricks work in pretty much exactly the same way. Except for the fact that you can not hold the slack in your hand. So you just have to let it drop over the inside edge of whatever hand the yoyo is grinding on. 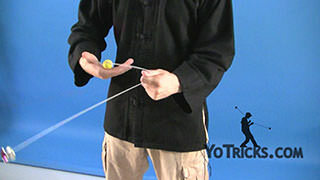 Once you have got that down, then you can start working on switching the yoyo from one hand to the other. 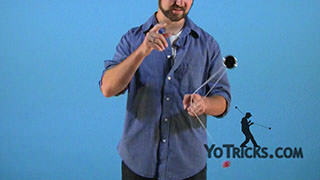 Now, when you first try this, what you might expect is that you have to hop the yoyo up vertically to the other hand. What you will notice is that if you do that, the yoyo and the counterweight actually separate in mid air, making landing the yoyo in the other hand pretty much impossible. So instead, what we need to do is, rather than hopping the yoyo from one hand to the other, we need to roll it from one hand to the other. 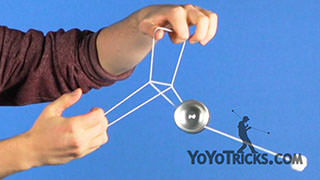 To do that, you want to hold the hand that is currently dice grinding the yoyo a little bit above the other hand. Then you can just tilt your hand toward the center line. The counterweight is going to roll down your hand and plop right onto that knuckle line on your other hand. If you want to go back in the opposite direction, it is just the same. 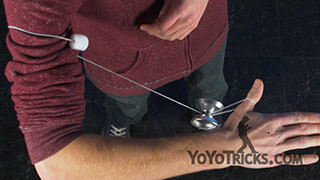 Just tilt it back towards the center line and the yoyo is going to be on the other hand. This technique can take a lot of practice, so it is something that you are definitely just going to want to do drills over and over with. Now, there are two different ways that you could dismount from this trick. Both of which involve grabbing the slack and then separating the yoyo and the counterweight. 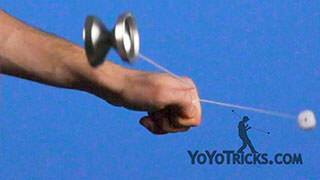 You can grab the slack either with the hand that the yoyo is spinning on, or with your free hand. 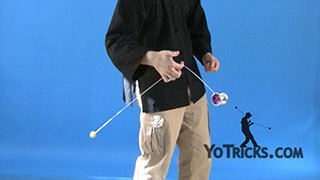 So to dismount with your free hand, you want to grab the slack that is underneath the hand that the yoyo is spinning on. 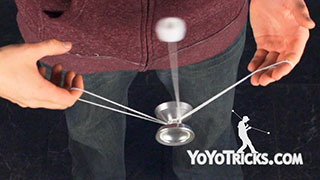 Pinch the string and then pull the yoyo and the counterweight off the hand and they are going to separate. Then you can get the counterweight back into your throwhand and perform a bind. 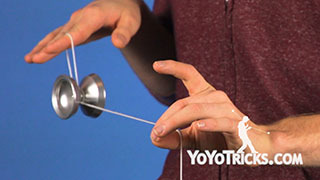 For grabbing the string with the hand that the yoyo is spinning on, we can actually hop the yoyo straight up vertically. The yoyo and the counterweight are going to separate. Then we can just grab the string because it is already on the inside edge. Then we can get the counterweight back to our throwhand and perform a bind. Now, Dice Grinds can be pretty challenging to master, but they are a really incredibly fun 5A trick. So, start at the most basic dice grind and then practice all the techniques that I discussed in this video and work your way up to doing the coolest dice grind variation that you can come up with. And that was Dice Grinds. Now, as you are going through this video, you might find that dice grinds are pretty difficult and they are really finicky and difficult to master, but they are the coolest 5A trick, so just go through this video and practice everything that I have outlined step by step, and you will be well on your way to being a 5A World Champion.